My principle for April was ‘Integrate rather than segregate’. I found a little time to reflect on this between child wrangling and Easter egg eating! 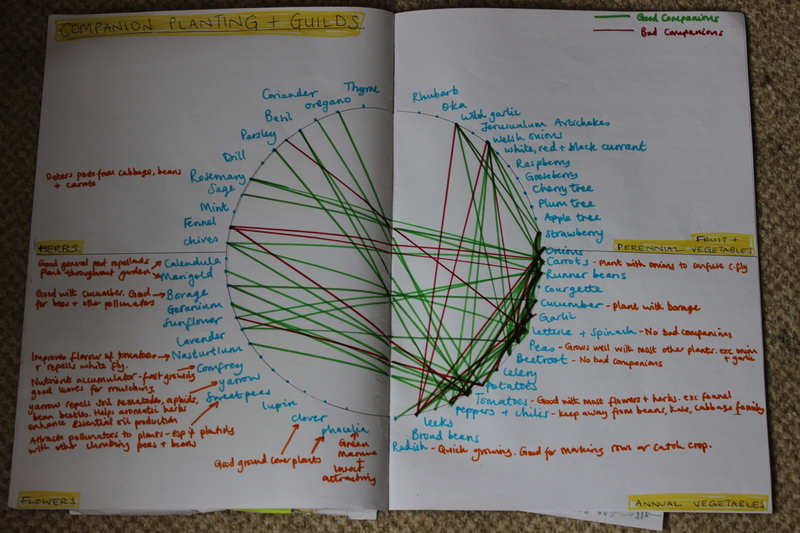 I looked into companion planting and guilds. I am working on improving the apple tree guild at the community allotment and writing up an info board to explain what plants are included and why. Quite a few of the parents who attend Muddy Boots, don’t have a clue about gardening, so I thought I would educate them! And those that do garden, well I plan to convert them to the ways of Permaculture! 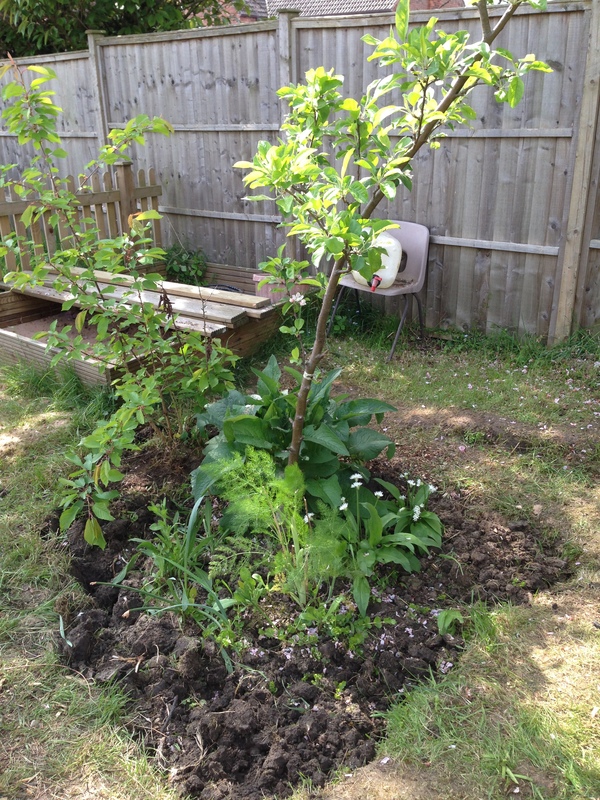 The apple tree guild as it looked yesterday after I weeded it to discover which plants remained after two seasons of neglect. I spotted daffodils, wild garlic, fennel and comfrey. I will be adding to this patch soon. I started making another web of connections diagram to show good and bad companions amongst plants that I am growing. I admit to getting too busy to complete this, but here is the picture of it as a work in progress.I should have increased the size or spaced the annual vegetable tags out more, as it is rather too crowded to read with ease. I am using companion plants and polycultures in my garden. I am leaving in quite a few of the more useful ‘weeds’ and lots of the volunteer plants that have self seeded into my patch. So rather than the sea of brown that I see at many allotment plots, my garden is already a riot of green growth with a wide variety of colours, leave forms and plant structures. Some will be weeded out as and when I am really to pop in seedlings, other plants will be left to grow on and put to good use in the garden or the kitchen. All ‘weeds’ are food for the chickens, so where others see a front lawn full of dandelions, I see a crop for the chickens to eat! 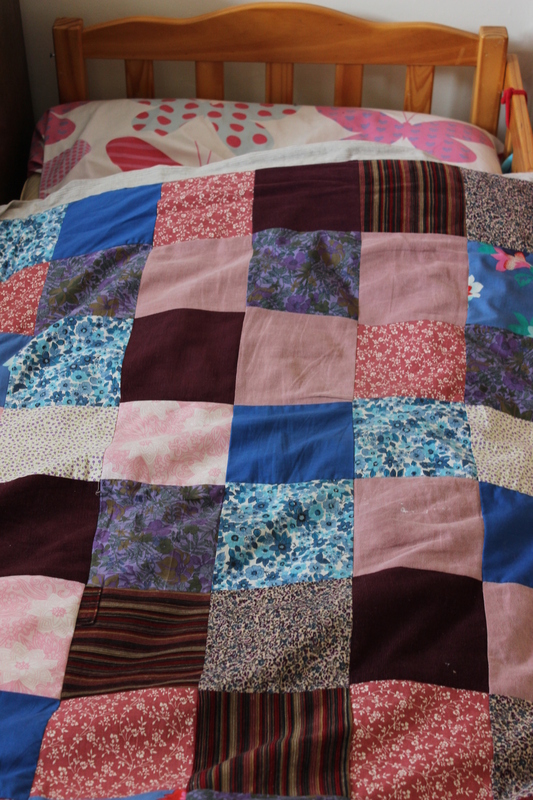 I have made a number of patchwork quilts for my children using fabrics from clothes they have grown out of. I thought this was a lovely way to integrate what would be wasted or passed on. It’s also lovely to look at their quilts and be reminded of them in their younger years wearing those dungarees or that pretty dress. I feel I am integrating the diploma into my life rather well. I am trying to make my diploma projects be about activities that I would be doing anyway, but Permaculture is helping me to do them far more effectively. It is also giving me the confidence to do things, like managing Muddy Boots, that maybe I wouldn’t have felt brave enough to take on otherwise. My neighbour, an elderly lady with mental health issue has had a gardener erect a 6 foot fence along the boundary of our gardens. We felt really sad about this and asked if she’d consider a lower fence and a trellis to keep the light and views from being blocked out of our garden. She said no. She has fenced in the other side too and seems to be wanting to block everyone out and alienate her neighbours. I feel sorry for her. In stark contrast to this, our neighbours the other side have great. Our kids are constantly in and out of each other’s gardens, we have put a gate between the two gardens which is always open. We all hang out together a lot. It’s a really lovely sense of community. These two stark contrasts of neighbourly relations seemed to me to highlight the importance of the principle ‘integrate rather than segregate’ and the yield you can obtain if you do so effectively. This entry was posted in Uncategorized and tagged community allotment, Companion planting, craft, food from my garden, Guilds, integrate rather than segregate, My garden design, Patchwork quilt, Permaculture, Permaculture Diploma, polycultures, sewing, Twelve principles for twelve months by emilycrofton. Bookmark the permalink.